Creating active directory with free templates and examples. Active directory has never been easier. Active Directory is a centralized and standardized system that automates network management of user data, security, and distributed resources, and enables interoperation with other directories. Active Directory is designed especially for distributed networking environments. Active Directory has three partitions. These are also known as naming contexts: domain, schema, and configuration. Active Directory is a special-purpose database - it is not a registry replacement. AD is designed to handle a large number of read and search operations and a significantly smaller number of changes and updates. In Edraw, you can find extensive pre-drawn symbols about active directory drawing. First open the Active Directory template, then drag and drop the shapes you need. With Edraw automated tools, you can design and layout easily. 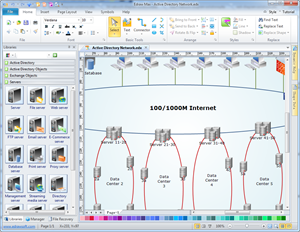 The diagram size, style and colors are all customizable. It only takes you a few minutes to finish the drawing. 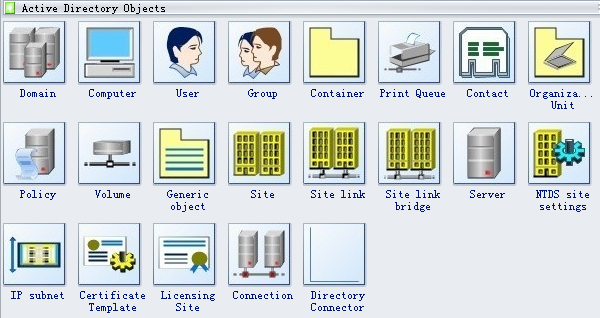 Edraw network software offers you plenty of special shapes of active directory objects, domain, computer, user, group, container, print queue, contact, organizational unit, policy, volume, generic object, site, site link, server, IP subnet, connection, etc. 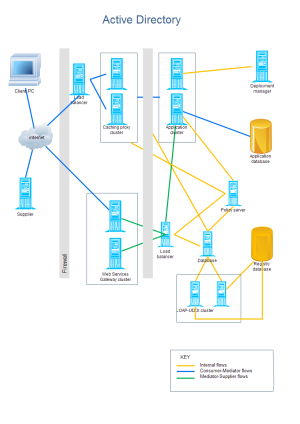 All these shapes will be good assistant for you when you draw the active directory network diagram. Here is a vector active directory template showing how this software can help you in visualization.